How to Contact Executive Recruiters? In earlier times, when the recruiters used to break people from rival companies, it was called as headhunting and recruiters as headhunters. However, do not use terms like this now. If you are initiating the connection, do not be derogatory in your language and this is not at all a good term. As mentioned above, recruiters build contacts in professional meetings and circles and if you need to be noticed and on their list, you need to actively involve yourself, as soon as possible in all professional and community activities. You can also join networking groups so that you are in the notice range of the recruiters, as well as their contacts. You just need to be visible at the right time and right place. If the job seeker wishes to undertake a direct approach, he can send a resume with a covering letter to some selected firms that work in the industry explaining what he wants and how can he fit in the positions. A line that you can add is that the recruiters can contact you even if you don’t match the needs as you have your own circle of qualified people who might and that you will be willing to refer them to the recruiter. The recruiter is more likely to call you as you will help him find the right candidate, whether you or your friend. It is well known that LinkedIn is a major platform for recruiters nowadays and it is all the more critical when a recruiter observes what all are you posting and how. The following things need to be checked by you –Who your connections are, what are you posting, and what does your profile say about you. The connections are important as the executive recruiter wishes to know that you are actively engaged and connected in your profile and industry. Hence it is important that you stay active and continue to build relationships so that you influence people. You also need to be active on the social media and your posts show what is your thinking, what is your opinion on few issues. To do this, you don’t need to spend hours on the social media, what you can do is just share a few important articles that you think are related to your industry and post a tip or comment on things that your connections share. Another important thing that your profile says about you is what you have done and it needs to be quickly and available in brief to the recruiter as no one has the time to spend hours in searching through your profile. Just give to the recruiter what he needs. Recruiters often receive hundreds of resumes in a week and are super busy people. They are looking for a specific candidate and a very specific profile and hence you need to respect their time. If they do not respond to your mails or calls, do not let it take down. Sometimes it is just a waiting game. You can continue with your search and building work. Keep on building your network and expanding circles, contacts. You never know when you might be the potential candidate that they are looking for and it may or may not be immediately but it can be the next time they have an opening. Many of our seniors had worked with recruiters at some point in their careers as a client or a candidate. Ask the most experienced professionals in your network to refer you. Other sources are the people you may know in your organization. Don’t be discouraged if the list of employers is short. In certain markets, recruiters who pretty have much openings work with big players of the industry. Be sure of offer quality referrals because unsuitable referrals can reflect poorly on you. The chances of getting a call are improved if you find the recruiter who specialize in your industry and function like pharmaceutical, financial services, finance, human resources etc. 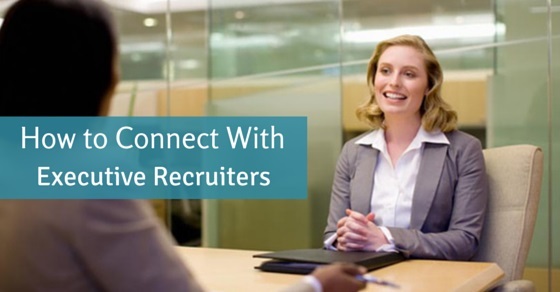 Reach out to a few executive recruiters who are connected or available to your through your contacts, connections, references. Be polite and then send them a compelling message which they cannot ignore and contact you. When contacting recruiters, you should be careful not to let go of persistence. It pays in life and in landing a job. Also, be sure that you have a positive profile as more than 80% of people will search for your name on google before they mail you or contact you to find all possible information about you. Many executives feel disappointed by recruiters who don’t reply to their resume mails or calls. You need to be patient and realize that they need a specific skill set for their opening and if you do not fit in it, they will not be contacting you. You just need to know the trick to connect to them and help them manage their job as well as your process of job seeking with more satisfaction. Next articleDoes the Type of Degree matter for Employment?